Mina Mina Jukurrpa relates to a major Women’s Dreaming site that is sacred to Warlpiri women of the Napangardi and Napanangka skin groups. Min Mina is located well to the west of Yuendumu in the Tanami Desert, in country that features and is dominated by salt lakes, claypan soakages and sandhills. The Dreaming describes the journey of a group of women of all ages who travelled east gathering food, collecting Ngalyipi (Tinospora smilacina or Snake Vine) and performing ceremonies as they travelled. The women began their journey at Mina Mina where Karlangu (digging sticks) emerged from the ground. Taking these implements the women travelled east creating Janyinki and other sites. Their journey took them eventually beyond Warlpiri country. The ngalyipi vine grows up the trunks and limbs of the Kurrkara (Desert Oak, Allocasuarina decaisneana) trees. Ngalyipi is a sacred vine to Napangardi and Napanangka women and has many uses. It can be used as a ceremonial wrap, as a strap to carry parrajas (wooden bowls) that are laden with bush tucker, and as a tourniquet for headaches. Major women artists, principally from the community of Yuendumu, have featured this important Dreaming story in their paintings. This story has many aspects associated with it – about the country, the ceremonial implements, the dance of the Ancestral women, the journey and the materials collected. Therefore the artists tend to focus on specific parts of the story for their paintings. Judy Napangardi Watson paints the sinuous shapes representing Ngalyipi, the Snake Vine, whose fibrous strands are used to weave ceremonial skirts for the dancers. Also Lajamanu artist Judy Napangardi Martin paints the woven skirts made by the ancestors and used by the dancers. 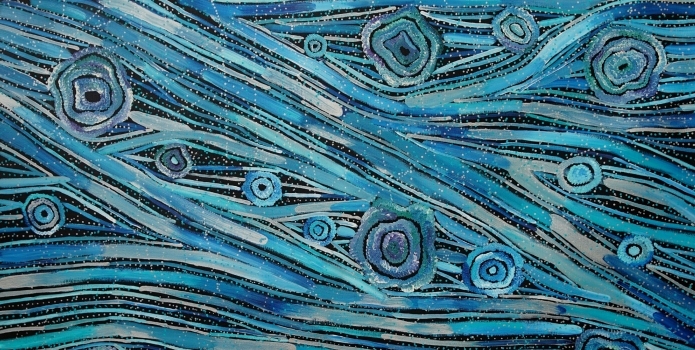 Dororthy Napangardi painted the country associated with the Mina Mina site – the surface of the salt lake country and sometimes the surrounding sandhill patterns. Dorothy Napangardi also shows aspects of the travels of Ancestral Women as they danced their way across country and encountered other Dreamings. The artist’s fine white dot-markings convey the movement of women, and also refer to elements of the surrounding landscape. This abstracted pattern of the country was also painted by Dorothy’s sister Margaret Lewis Napangardi, who occasionally added her own sinuous bands of sandhill structures to some of her paintings. The significance of Mina Mina to Warlpiri culture is embedded in the dance and songs shared by the women at this ceremonial site, contributing a powerful resource to the painters who depict this subject. The style can vary between artists - from intensely coloured, sinuous structures to very refined and minimal monotone paintings. The paintings manage to capture the Dreaming narrative as well as the location, finding the inter-relationship between the ancestral story and the sense of place.